To better understand progressive retinal atrophy, one must have a basic understanding of the function of the retina. The retina is a highly specialized tissue that lines the back of the eye. The retina is analogous to film in a camera; it is responsible for integrating light into vision. Without adequate retinal function vision is not possible. Simplified, the eye can be thought of as a light collecting organ that focuses light rays on the retina. As light strikes the retina, a sequence of chemical reactions are initiated. The sequence of chemical reactions propagate an electrical impulse. The impulse passes through the layers of the retina to the optic nerve and finally to the brain (visual cortex) for interpretation. The brain’s interpretation of the light signal is responsible for what we know as vision. The retinal cells which transform light energy to chemical energy in the retina are known as rods and cones. Rods are responsible for black and white vision, night vision and vision for movements, whereas cone cells are used for color discrimination, vision in bright light and acute focal vision. Most domestic animals (dogs, cats, etc.) have a dominance of rods. Color vision in dogs is poor compared to people. As the name (progressive retinal atrophy or PRA) implies, an atrophy or a degeneration of retinal tissue occurs. In many animals a slowly progressive disease occurs and the early signs may be overlooked. The slow loss of sight is similar to a dimming switch to reduce brightness of light in a room. If the light is slowly reduced over a long period of time, our eyes adapt and the change is not noticed until darkness occurs. A similar situation occurs in progressive retinal atrophy in animals; often the condition is not noticed until the condition is significantly progressed. Unfortunately there is no cure available for progressive retinal atrophy. Identification of affected breeding animals is essential to prevent spread of the condition within the breed. The early signs of retinal atrophy include night blindness in most cases, which will frequently progress to day blindness. Pupils may be dilated and/or have a slow response to light. Some pet owners will notice a characteristic shine from the eye. 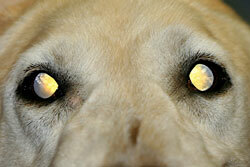 This is due to increased reflectivity of an iridescent tissue known as the tapetum located underneath the retina. Night blindness may be manifested in a number of ways, including a pet that is afraid to go out in the dark or go into a dark room. Often these pets will get lost in their own home after the lights have been turned off or they may stay near the light in the back yard at night versus wandering the full extent of the yard as they did previously. As previously mentioned, retinal abnormalities may not be noticed at home until later in the course of the disease. Other well developed senses including olfaction (the sense of smell) and hearing help animals adapt to the slow loss of sight. Often sight loss is not noticed until a change of the petsâ€™ normal environment occurs like when furniture is rearranged in the home or the animal is taken into a different area or is boarded while you are away on vacation. Because PRA can be difficult to identify, routine ophthalmic examination of all pets is recommended. This is especially important in animals that are being considered for breeding. When the ophthalmologist views the retina with an instrument called an indirect ophthalmoscope, changes can be seen in the retinal blood vessel pattern, the optic nerve and the tapetum (the reflective portion of the eye that is responsible for “eye shine”). However, some breeds characteristically have little or no early visible changes and may appear normal until the later stages of the disease. Some affected dogs show various rates of progression making generalization difficult. Cataracts may form secondarily to progressive retinal atrophy in some animals and are generally associated with the later stages of the disease process. Formation of cataracts may interfere with direct visualization of the retina and make other diagnostic modalities essential. Although cataracts are a surgically treatable, removal of cataracts in an animal with progressive retinal atrophy is not indicated, as their diseased retina will still prevent them from seeing. Because cataracts can cause secondary consequences within the eye, they should be monitored regardless of whether or not surgery can be performed. Definitive diagnosis of PRA is supported by electroretinography. An electroretinogram is similar to an electrocardiogram (ECG) for the heart in that they both measure normal electrical impulses produced by the organ of interest.. A special contact lensis placed on the cornea and two tiny needles (electrodes) are placed under the skin around the eye. After a period of dark adaptation, flashing lights are used to stimulate the retina. The electrical response of the retina is recorded by the electrodes, which send a signal to a computer. A healthy retina will produce a characteristic recording. This instrument is sensitive enough to diagnose affected dogs before they begin to demonstrate clinical signs. Any diagnostic procedure can introduce complications, including anesthetic risks (in the few patients that require anesthesia for diagnostic procedures). However, complications from ERG are very rare. Nevertheless, potential complications include, but are not limited to, inflammation of the pink tissue (conjunctivitis); ocular infections that may affect internal and/or external areas of the eye (intraocular/extraocular infections) and corneal ulcerations (superficial to deep). If any abnormalities are noticed in your dogs eyes following an ERG please notify us immediately so that the condition does not worsen. Since PRA is an inherited genetic disease, it is possible to identify and test for the defective gene. This test has been developed in some breeds affected by PRA. The test requires a blood sample, which is sent to a diagnostic lab for analysis. The blood test can identify dogs that are affected, as well as normal dogs that may pass the defective gene to offspring. Information on genetic testing can be found at www.optigen.com. Unfortunately, no treatment has been formulated to prevent, treat or cure progressive retinal atrophy. A number of vitamin therapies have been suggested, however, there is no evidence to suggest that vitamins have any therapeutic effect. As stated previously, affected animals should be identified as early as possible and eliminated from breeding programs. Progressive retinal atrophy is a painless condition. Animals that lose sight from PRA usually acclimate well to their environment with time, as they utilize their other senses to make up for their vision loss. Maintaining a consistent environment for the affected animals will help the acclimation process. For example, frequent furniture rearrangement during this period should be avoided. When animals are taken from their home environment, the use of leads and harnesses are helpful in addition to reassurance to comfort your pet. Progressive retinal atrophy refers to a broad category of inherited retinal diseases that result in gradual blindness. Because of the insidious nature of the disease serial examinations may be required to detect affected individuals. Affected individuals should not be used for breeding purposes.